These are pictures of my finished arcade cabinet in the Allegheny College art gallery. The red line behind the cabinet was part of another student's work but ironically it set off the red present on the cabinet's buttons and title panel. Introduction - What is a Senior Comp? A senior comprehensive project is a requirement for any degree awarded by Allegheny College. Students usually refer to this in its shortened form "comp". A close equivalent of a comp at other places would be a senior thesis. A comp is a way for a student to do their own self guided research into an area of their current discipline. In the studio art discipline the comp takes on the form of a body of art work and a written report of the techniques, artist research, and documentation of the project. This project is chosen entirely by the student but must be accepted by a panel of professors chosen by the student. These professors serve as advisors and ultimately judge the project to determine the grade on your comp. The comp is the student's chance to take all of their accumulated knowledge in a discipline and apply it to an original project. The pace of the project and the motivation is solely up to the student, although a schedule and timeline are required by the panel. A midsemester review is also held to provide the student with feedback on how well the project is progressing and also actively critique the current state of the project. The outcome is quite simple; you must successfully finish your comp to earn your degree. For my senior comp I chose to reverse engineer video games. Video Games as a Senior Thesis Focus? When I had to think of an idea for a comp, I already knew that I wanted to do something game related. This common thread of games seemed to reappear in most of my major works at Allegheny. My other works had been board games and I decided I wanted to reverse engineer video games into an educational form addressing a social niche. At the beginning of the comp I had the thought to continue on the theme of racism, but this focus became narrowed into addressing a single social niche of the stereotyped modern day terrorist image. I discovered that since the September 11th attacks most people are trained to think that Middle Eastern people are exclusively terrorists. The media seems to propagate this message and continue to sell it to the American people. 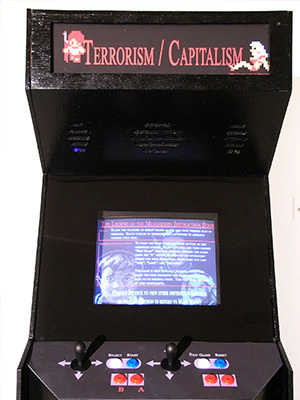 This really didn't hit home until I discovered all of the anti-terrorist games in arcades and on the net contained about the same theme. The hero is always the white all American stereotype and the villains are always another culture, or race. I had reasoned that if games were being used to condition people's thinking then perhaps I could create games which have the opposite effect. I downloaded ROM copies of the games and an emulator to run them on because of the availability of free ROMs on the internet. I began searching for ROM games that had a simple story line or had a plot that already had a subliminal twist to it. I found three games that had the criteria that I was searching for and then began to alter those games to educate people and show them that they are in fact being conditioned to think certain ways. For the comp itself I took three games and hacked them using various programs. This process is highlighted in full detail in my written comp. These games were fully interactive and hosted on my computer. I placed my computer in an arcade cabinet that I designed and built for this project. I wired the arcade cabinet's buttons to an I-PAC circuit board which converted the signals from the switches into USB, basically letting the computer think the audience member was using a keyboard instead of buttons. 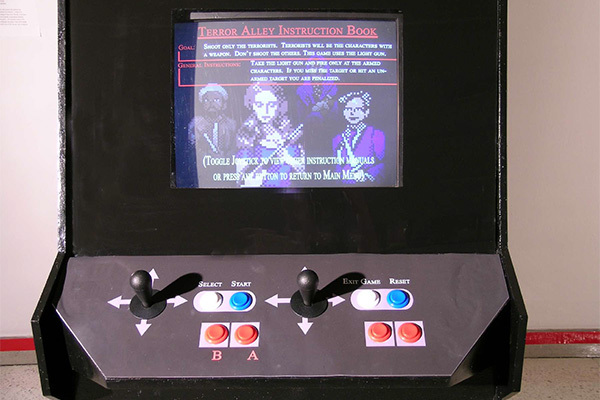 The keys were then mapped to the controls of the emulator program. I installed and configured a front end to make the game selection easier for the viewer and to secure the desktop from intrusion. 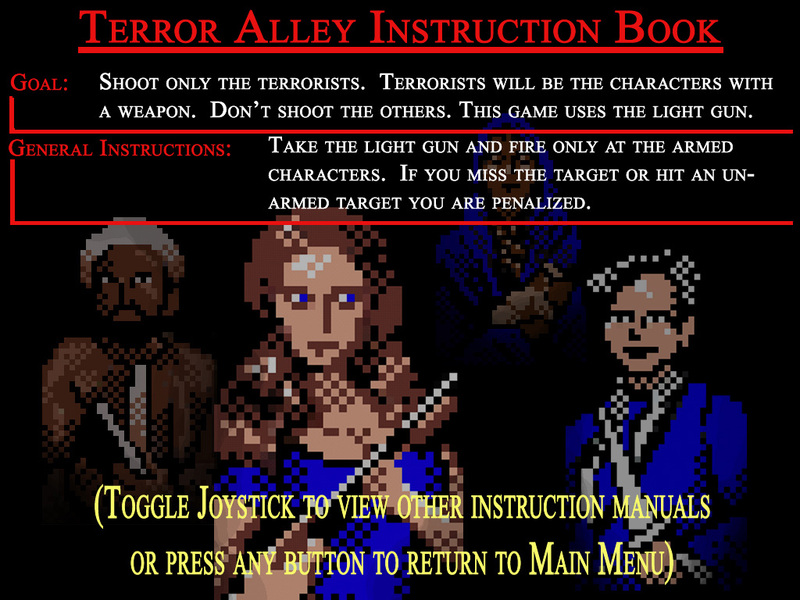 I did not include the exit key for the front end on the player controls for added security. I did however map a couple keys that would allow the user to reset and exit a game. 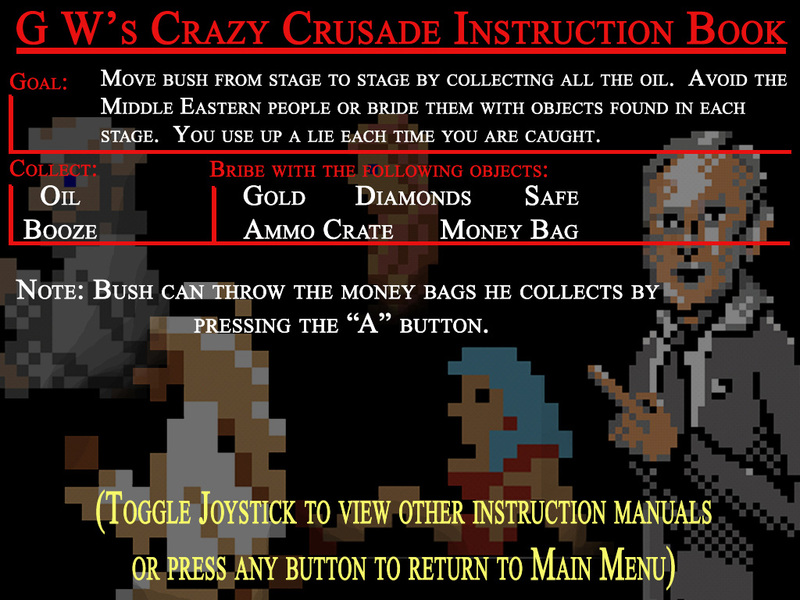 I had on screen instruction booklets for the George W's Crazy Crusade, Legend of the Mujahidden, and Terror Alley games that would come up with the operating system's screensaver. I simply put the images of the books in a folder and set the screensaver to a slide show with a two minute delay. The screen saver would then display the images on the screen as an idle function when people were not playing the games. In the next section I explain the changes briefly for each game and the ideas I wanted to convey through the work. For a more thorough discussion about the technical details of the project, I refer the interested reader to the technique section in my written comp. Finally I have the games and visual documentation which can be downloaded and played. The Senior Show at the Art Gallery and Final Outcome? 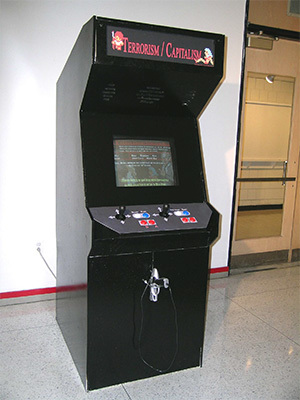 The final works were displayed in the gallery in a completed arcade cabinet. The show was a big hit and I was awarded the outstanding senior comp award for my efforts. I had to defend my work before my panel where they discussed my work with me. Ironically the discussion was centered on the legal issues involved with this type of work and what this meant to the artist. I have provided a condensed version but if you are interested I do have a copy of the written portion of my comp. In my written version you will find a concise report chronicling the progress with my comp, a complete listing of all the relevant artist research involved in the project, and an explanation of the techniques used to hack the games. I also have the visual documentation files of the senior comprehensive project. 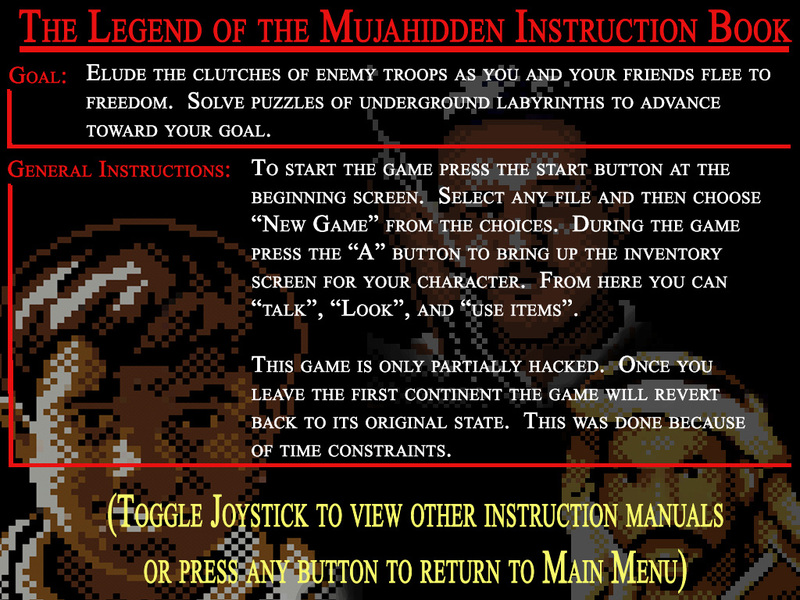 Please feel free to download any of the hacked game titles. You will notice that the spaces in the file names are replaced by underscores. This is because my front end, which was used in my senior comp to house the games and emulators, did not like spaces in titles. I have chosen to keep those files named as such just for convenience, you can rename them anything you wish as long as you retain the proper extension. These games can be played on any emulator which supports the .nes file extension. The emulator of personal choice has been the fceu.exe emulator from www.emulator-zone.com. This emulator is really easy to use, easy to configure, and is free. I have altered the games in accordance with fair and free use rights as an artist. I have openly distributed copies of my own work for others to enjoy and alter as they see fit for the sake of creativity. However, any duplication or alteration for the sole purpose of selling the game for a profit is still very illegal. I ask that you respect the copyright rules that come with the games and not alter them for a capitalist venture. By downloading the games you have agreed to the contract set forth by the artist (me) and the original creators of the game. Other than that I hope you enjoy them as much as I have.